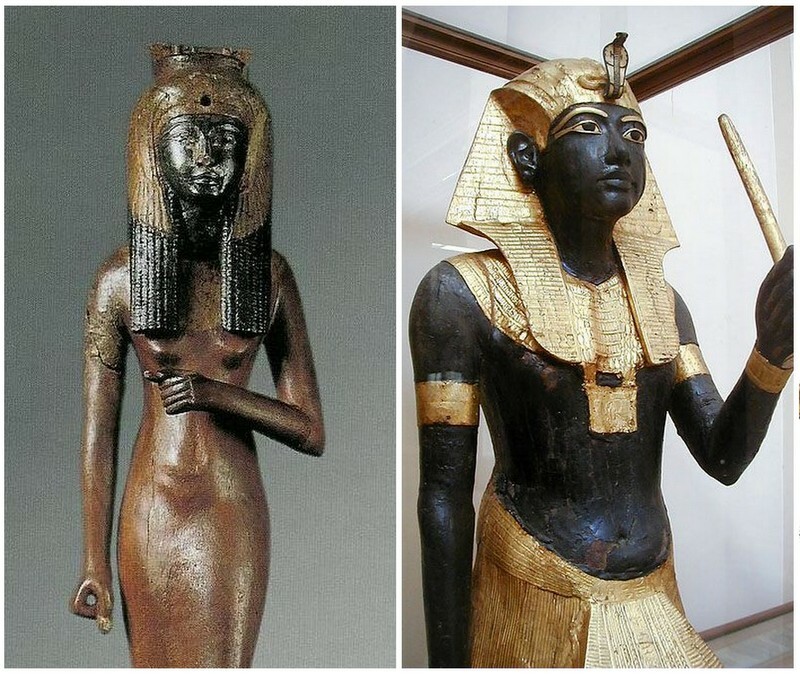 In Pharaonic antiquity, the pitch-black color was God’s and deities’ prime color. Why did our ancestors think so? Many will answer this question by saying that Egyptians were black; therefore, they imagined the creator like themselves. 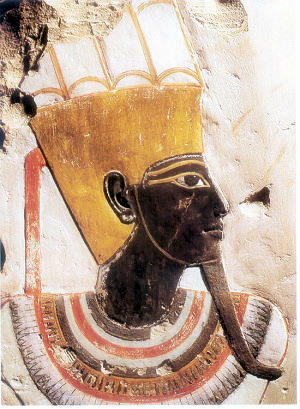 However, not all Egyptians were so dark in complexion. There were the 4 main types of black complexion in Egypt: the greater majorities were pitch black and dark brown, there was also a minority of Blacks with light skin and Albinos. It is the same thing that we can see in all African countries, maybe except with the Sudanese who without mixing with the Arabs – have always been the blackest people on earth. Then, why giving this pitch-black complexion to God? It is actually because of the Sun. Like we explained before in our article on the African Spirituality, God is the hidden consciousness, that created the world by His-Her own initial Energy. This Energy is present within each element of creation. God is everywhere through His-Her energy present within all things. Hence, the strongest energy perceived by humankind is the one of sunrays. Moreover, the Sun is a benefactor because it gives light to earth. It also gives life by making plants grow (photosynthesis) and by allowing liquid water. The sun is necessary for life. The Sun as main energy, benevolent star and life giver, is therefore God in miniature and God’s main messenger on earth. This explains why Africans were the first people to say that God is light. 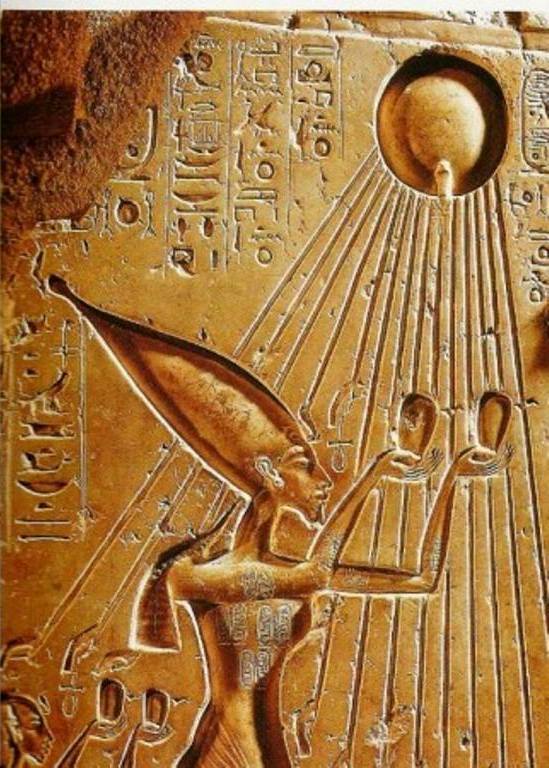 Pharaoh Akhenaten giving offerings to the Sun – God’s messenger – that brings life through the rays. This giving is represented on the picture by hands at the end of the rays, which hold the Ankh Cross that is the symbol of life. This is why sunrays (Ra) were so much venerated in Egypt. This same Ra/Rana is God’s name among the Hausa people. The cult of the Sun, God’s messenger was performed by the Fulani people under the name Buudal Yurmende (Great solar disc of mercy). Among the Bassa people of Cameroon, it’s through the Sun (Djob) that this people call upon God. 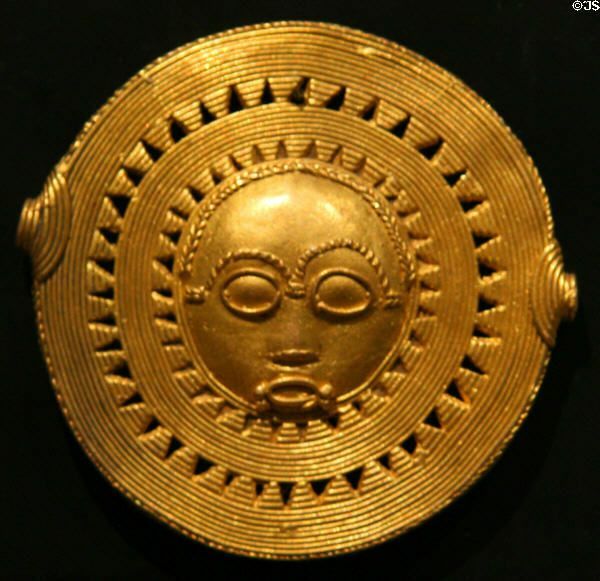 The baKongo people say God is also Ne Mbumba Lowa (Great solar Creator). The same Sun was a central element in Nelson Mandela’s funeral rites in South Africa etc. In modern African languages, we have words like Khem/ Kembu/ Kheum/ Khemit/ Kama/ Kala which mean coal/burnt/black. And that is why the African word Kam/Kham produced the word Cham/Ham, that designates black people in Hebrew and in the Bible. It is the same word that brought forth the word Chemistry, given the fact that baking is a scientific reaction. Thus, Blacks in the African language are baked. Baked by what? Obviously by the sun which is God’s messenger. We therefore see that for Akhenaten, the Sun leaves its mark on human beings. This mark is the black skin. The Greek scholar Herodotus who visited Egypt during the era of Pharaohs, said ‘Heat makes men black’(II.2). This was to explain the skin color of Egyptians and other Africans. The concept of black skin due to the Sun was therefore known ever since. Thus, Blacks are the Children of the Sun, and Whites, who owe their color to the quasi absence of sunlight in ancient Eurasia, are the result of the cold. Subsequently, in the ancient vitalist (animist) thought, the blacker one was seen as the product of the Sun, God’s messenger. The blacker we were, the more divine and blessed we were perceived. The blacker one was – according to what was said earlier – the more perfect and accomplished one was seen. That is why God and deities were represented with the blackest color: pitch-black. Usiré (Osiris), son of God, He symbolises good. He was also called Kem Ur, that is to say the Great Black. 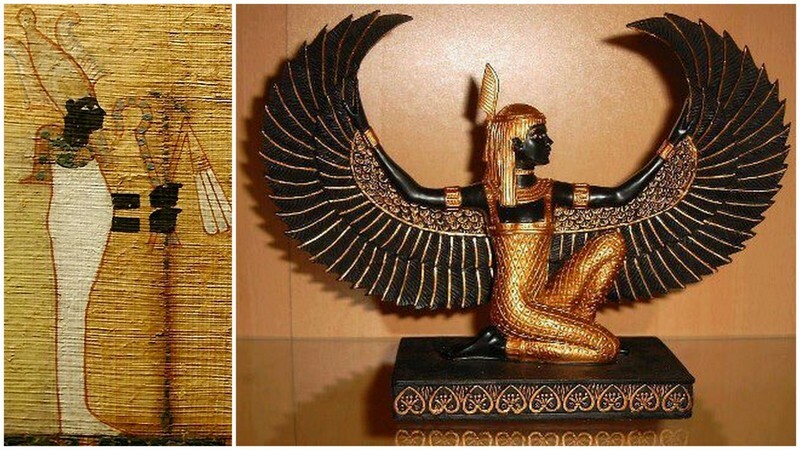 Maat, daughter of God, She symbolizes order, morality, virtue, harmony and justice. To the left, Queen Yahmesu Nafooret-Iry (Ahmes Nefertari). She was born with this pitch-black color and had been seen as divine since her birth. She is the matriarch and cofounder of the most prestigious dynasty: the 18th. She was the most venerated Queen in antiquity. To the right, her great great grandchild, Pharaoh Tuanga Imana (Tutankhamen), who is represented in black after his death as a divine ancestor and intermediary between God and humans. 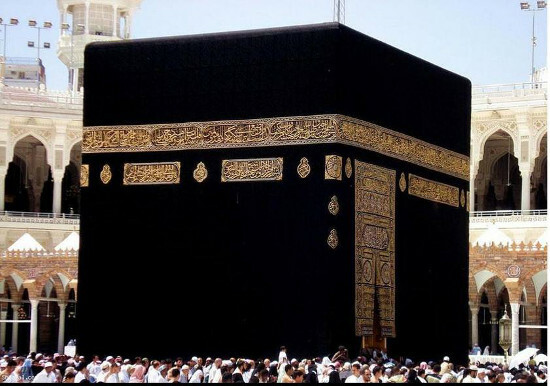 The Kaaba, black and sacred stone in Islam. It is venerated according to the same principles. Let’s remember that the first black inhabitants of Arabia, called Sabeans, practiced Vitalism (Animism). It is on the basis of this African spirituality deeply transformed, that white semites came later to found Islam. The Kaaba was also venerated by the Sabeans at that time. As Africans, they went on their pilgrimage singing and dancing. They also practiced the cult of the Sun, messenger of their masculine and feminine God, a cult later demonized by the Quran (Sura 27). We can still find these relics in Islam. The 5 daily prayers are simply the Sabeans’ 7 daily prayers, performed according to the different positions of the sun during the day. This concept appeared in India, which was first populated and civilized by Black Dravidians from Africa. That is why in Hinduism – inspired from the African religion of the first inhabitants of the country – has pitch-black deities. 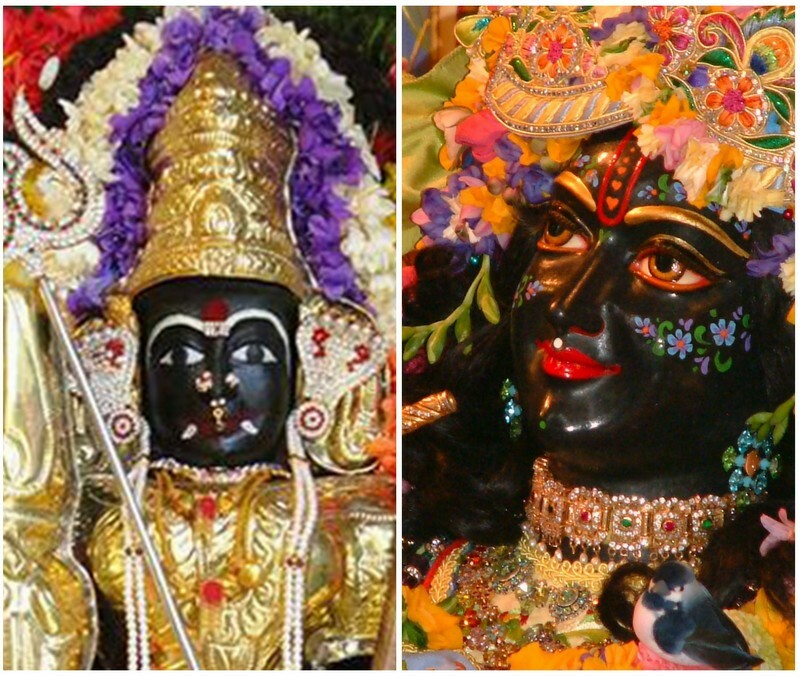 An example is the one of Hindu deities such as Mariamman and Krishna. 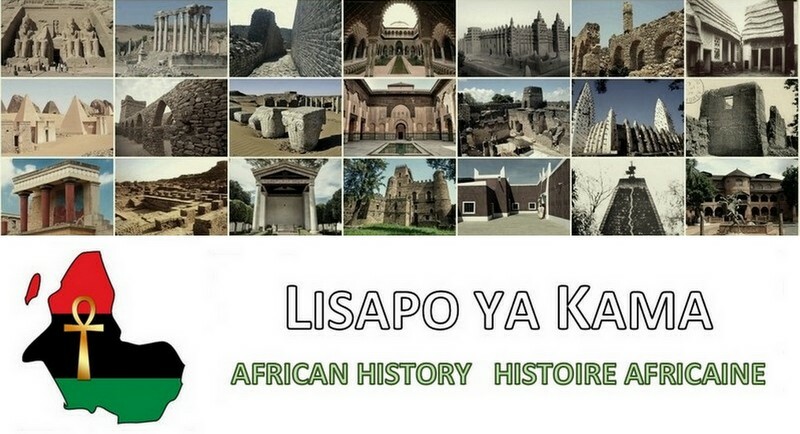 This concept appeared in Greece, cradle of the European civilization – which was first populated by Blacks (Pelasgians, Minoans) and later civilized by the Egyptians. 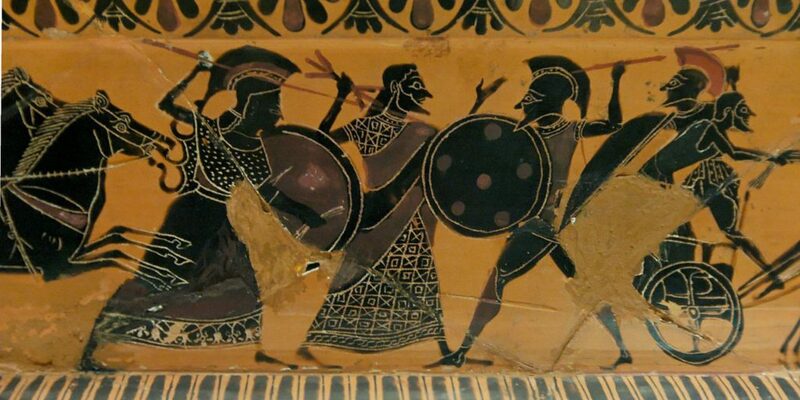 Zeus, supreme God of the Greek people, is represented at the center of the picture. Zeus was the replica of Imana-Ra. This color on this illustration was wanted by the authors; people at that time knew how to portray Whites. 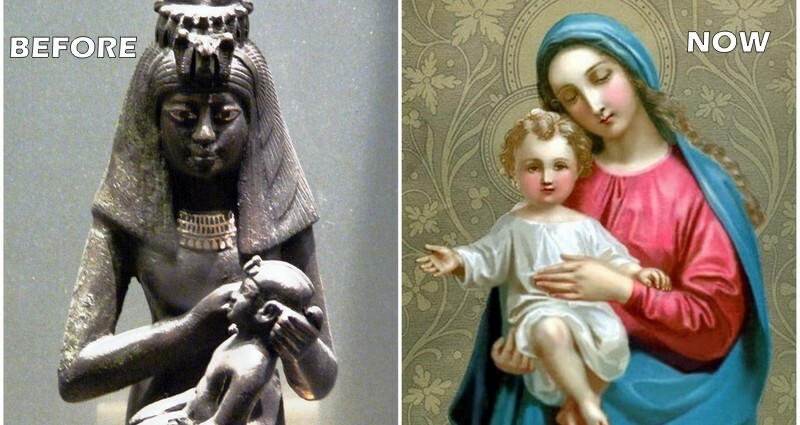 2600 years ago, Egyptians spread the cult of the virgin mother Aisata Mari-Amen in the East and Europe. 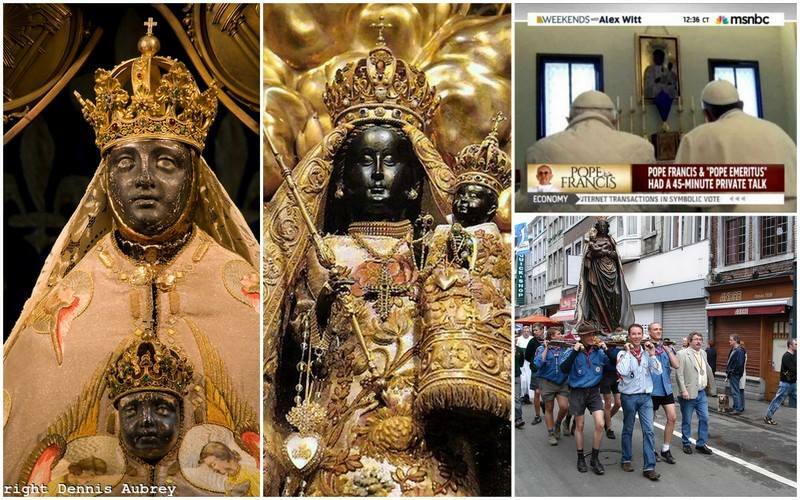 The cult of the black virgin and her son was Europe’s main religion during centuries until the Romans took it up and transformed it around the 4th century to officially create Christianity. Aisata Mari-Amen (Isis loved by Amen (God)). She was also called Setkem (the black woman). She holds her son Horo (Horus), born from Usire through immaculate conception, divine child sent to save creation. Mari became Mary by copying the Egyptian religion, which Romans did. In Christianity, Cham (the Black) is cursed (Genesis 9, 18-19). It is due to Christianity that Blacks started seeing their complexion as cursed and maleficent, while they used to consider themselves as blessed thanks to Vitalism. Statues of Isis in Europe, with her pitch-black color, relics of her prominent cult before the advent of Christianity. 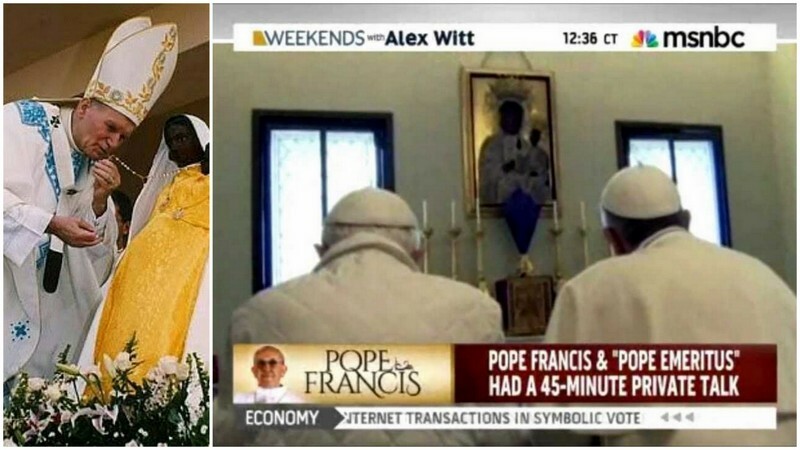 The last 3 popes (John Paul II, Benedict XVI and Francis) bowing down before Aisata (Isis) Mari. Sometimes, Christians revert to the original African doctrine. The black color is therefore a blessed color for our ancestors and not a cursed one. 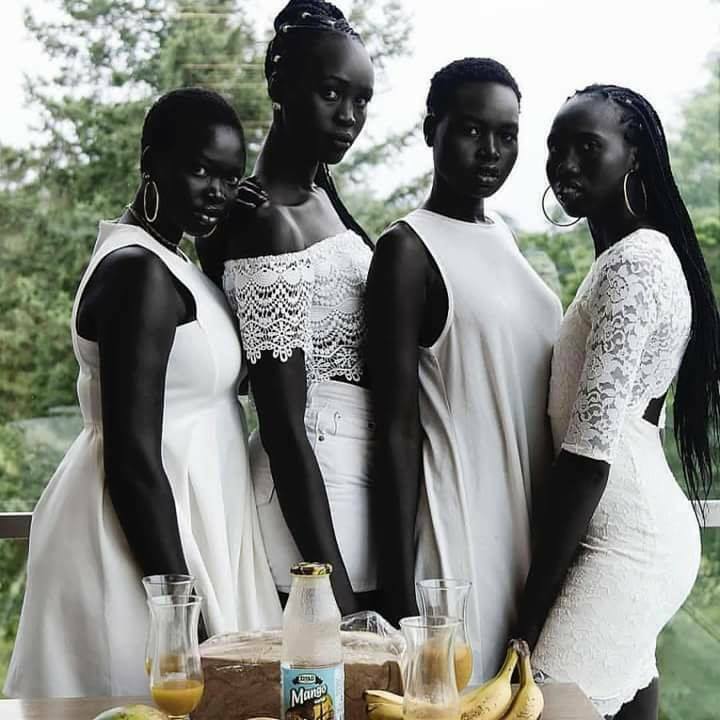 Africans, be immensely proud of your skin color and your physical appearance, instead of trying to bleach or lighten your complexion in order to look like God knows what or who.